Show off those sleek curves with this Dr. Carol Marcus Blue Dress! 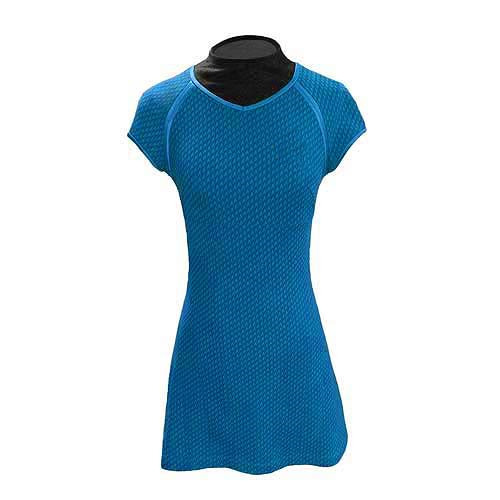 Take home the blue dress worn by Dr. Carol Marcus in the Star Trek Into Darkness movie. Highlight your contours with this dress! From the sleek curves to the subtle design of this dress, the Star Trek Into Darkness Movie Dr. Carol Marcus Blue Dress embodies the woman. This alluring micro-dress features a charcoal yolk, supple fabric, and a slenderizing cut that will highlight the contours of your figure. Using meticulous research from multiple screen-used pieces from the Star Trek Into Darkness film, this dress was produced with the same dyeing/printing from the original manufacturers. All eyes will be on you when you wear this unparalleled replica uniform! Please note that the badge is not included with the dress. The item goes over the head like a sweatshirt. It does not fasten. The luxurious blue dye was replicated by the original production team, and the pattern was created using various screen-used dresses from the feature film. The intricate delta-print pattern was reproduced as the original. Made of authentic heavyweight spandex to capture the correct draping and flow, the elasticity and fabric thickness allows for a sleek but forgiving contour. Note the high empire waist, cap sleeve, ribbing detail with accurate piping thicknesses, and accurate stitching accent and designs.